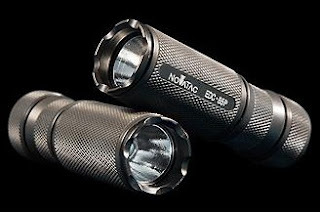 The Novatac EDC is the sequel to the HDS EDC line of flashlights, the light uses a SSC P4 LED capable of up to 120 lumen and has different levels of brightness that can be programmed. It uses a single 123 battery. The light has four modes of operation, each mode can be programmed to a selected brightness level or a signaling function. From Off you can go to primary mode pressing the tailcap switch or to max mode doing a click-press. Once on you can change primary/secondary with 2 clicks, you can go to minimum mode via 3 clicks or to maximum doing a click-press. Each of this four modes can be programmed so we call them maximum or minimum just because it is the factory default. To program enter the mode you want to change and do a click-click-press, you will be able to change the brighness level with 22 levels available, if you continue past the maximum level you will be able to assign a disorienting strobe, emergency strobe or SOS to the mode. This means that if one of your modes is the strobe then you have only 3 brightness levels to set. Since you can program and reprogram the light on the fly quickly this is not a big problem. From an options menu you can also program a locator beacon and other settings that can be set on or off depending on your preferences. Programming is very flexible and simple to do without a manual. The light is bright reaching 120 lumen but is not as bright as other single cell Cree LEDs in the market. It can run for about 20 minutes in maximum before dropping to a lower level, all the brightness levels are regulated so the intensity won't change as the battery gets depleted. It can use any type of C123 batteries. This is good if you find a level that is perfect for your activities since it will keep constant. The beam is a good compromise between throw and flood, the tint of the LED in our test model was blueish / purple. The interface is very easy to use but can be a little annoying with the click, double click, triple click and click press getting confused sometimes. The body is constructed in HA-III aluminum resitant to scratches and impacts, the lens is polycarbonate glued to a bezel with slight crenelations to know if the flashlight is on or off. The light comes with an optional pocket clip that to our taste wasn't very good, it didn't seem to be very solid and it was too bulky and protruded a lot from the light body. We found the Novatac 120P and excellent EDC light very flexible and easy to set to your own personal preferences, the maximum brightness is not incredible and the runtime is a little short, the tint was poor and the pocket clip is not very good, for the price we think it is either a love or hate flashlight that will be very good for those that like programmable lights with many options, other users that focus more on the output and performance than a list features might be disappointed. You can order from LightHound for $150.